The consignment shop where I drift in and out to find bargains has a winter sale which is exceptional. They need to clear out their sweaters to make way for the lightweight tee shirts of a warmer clime. Ribbed sweaters of rich blue, soft flannel gray sweaters, or cotton sweaters with sun bursts of color. The textures and subtle designs warm the eyes, and the brain promises a cozy feeling if wrapped in a blanket made from the pile. If I cleared out my dresser, the choices would grow exponentially. The fabrics of the sweaters matter. If constructing a quilt from wool or wool blends, the sweaters can be felted or just wash them in cold water with little agitation and lay flat to dry. Cotton sweaters are more forgiving when washed. The common sense approach would be to use only one fabric for each quilt to make the continuity and care easier. The rest of the process follows standard quilting logic. There are tutorials on line that will guide a stitcher through the serger process, blanket stitch binding and tying of the corners. 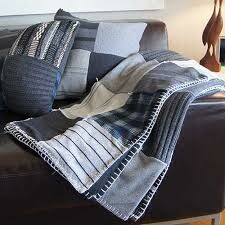 Using a sheet for a backing creates a soft, cozy, blanket to wrap around shivering shoulders. Upcycling is a specific way of recycling that involves turning unused products into useful ones. Actually, upcycling tries to make the finished product more desirable than the original items. In the case of sweater quilting, attention to the fabrics, textures and coloration will increase the appeal of the final comforter. Upcycling keeps the landfill free of useable knitted sweaters. One creative sew-er created an Ugly Christmas Sweater Quilt from the family’s stash of fancy seasonal sweaters. Taking some wool sweaters that had been accidently “felted” in the clothes dryer, a warm and cozy sweater blanket for a child was created. Cashmere sweaters worked well in these quilts, also. Memory quilts made from a loved one’s sweaters can create a comforting blanket to use for reading books that share a passion for historical fiction or cozy mysteries with the person whose sweaters are now upcycled. Guess it is time to scour the closets in the house for all the clothes that are two sizes too small. I don’t fit into these sweaters anymore. But they will feel warm on a frigid evening as a lap throw, and will remind me of happy times gone by. Sweater quilts. A “chill chaser” with understated style. Made by Barb.com “Up-cycled Sweater Quilt”, April 1, 2016. 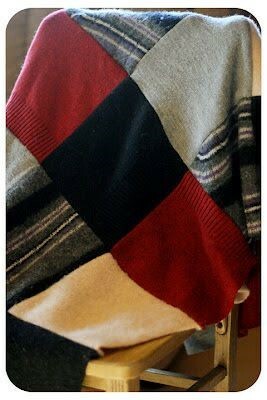 Bull Rock Barn and Home, “How I Made a Recycled Wool Sweater Blanket”, March 20, 2012.
recycle, Sweater Quilts, upcycle. Bookmark.